Meghan Markle has already stepped into her role as the Duchess of Sussex with the ease, grace, and dignity befitting a Suits star, but we at Dirtcast are not quite ready to let these beautiful, British nuptials go into that good night. The wedding! The wedding. A day for merriment and monarchy—one that you might have watched from the live stream, or via tweets or, if you were a smart cookie, through the lens of Jezebel’s very own royal wedding correspondent Kelly Faircloth, who graciously hopped on the horn all the way from London to share with us her experiences running around Windsor like a madwoman, clutching tea towels and British gummy candies, sleeping on a camp chair, and snapping a picture of the Duke and Duchess of Sussex that looks as if they’re old friends. 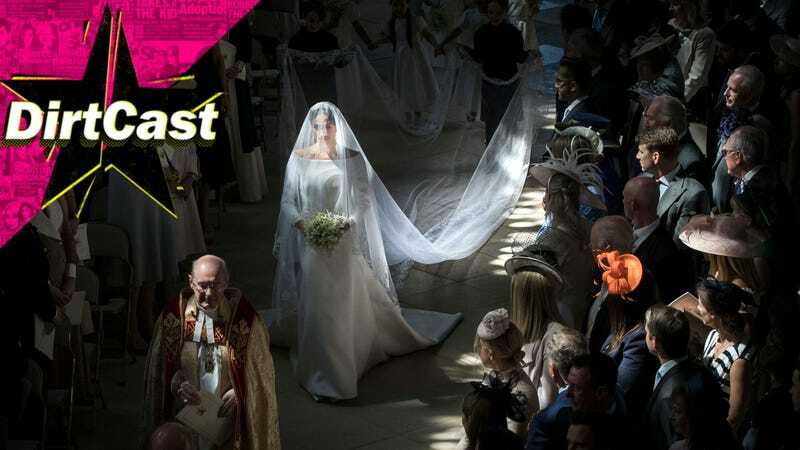 We discuss The Dress, the ceremony, the pomp, the monarchy, and the way everything about the ceremony was designed to make you—the peasant, the plebe—feel small. Will Meghan Markle ever “work” again? Did the fates groom her for this from the very start? Join us for a good time.